With its ping-pong set-up, picnic tables and charcoal grill, the outdoor seating area at Chicago’s Ada Street feels a lot like a buddy’s backyard—but with way better food. Every day, the restaurant fires up that grill to make smoky, charred dishes like a fairly incredible summer bruschetta: grilled bread topped with fresh ricotta. To make the toast, Schor slices thin rounds of bread (she opts for either a whole wheat and hemp loaf or a shallot bun from Publican Quality Breads) and places them on the grill, dry. “Too much fat over live coals causes smoke,” she says. (If you’re going to add oil or butter, do it after the toasts are done grilling.) Check the toasts after about 15 seconds. “But it could take 30 to 45 seconds or longer if you’re dealing with indirect heat,” she says. “A good rule of thumb is to move, check and turn the toasts often so as not to burn them.” As the toasts finish cooking, move them to the cooler outside of the grill to keep them warm until you are ready to serve. 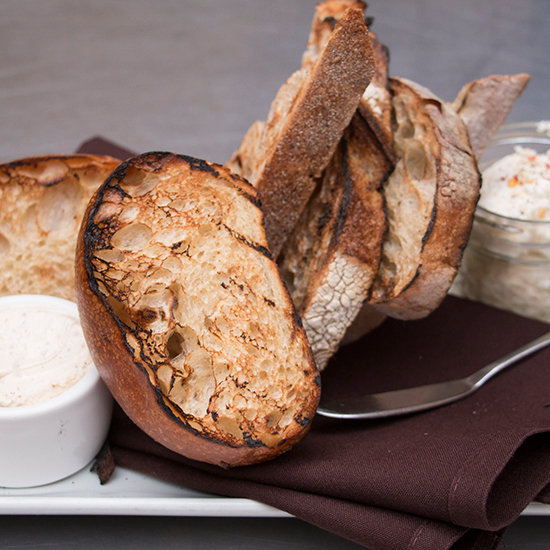 At Ada Street, Schor serves the toasts with house-made ricotta garnished with crushed red pepper flakes, sea salt and fresh cracked pepper. (Learn how to make fresh ricotta at home with these illustrated step-by-step instructions.) But you can use the slightly smoky, super-fast toasts for whatever you want. Try them topped with pesto and grilled vegetables or grilled fruit and honeyed mascarpone for a delicious dessert.